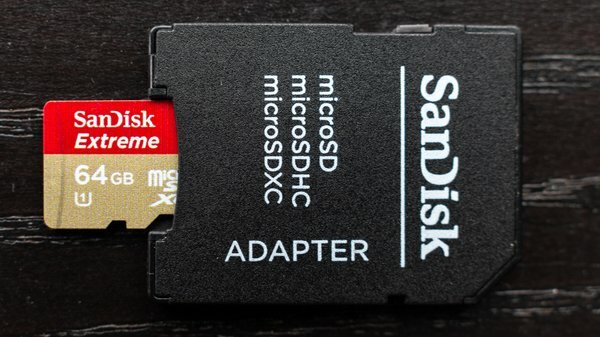 By Wesley Fenlon on July 24, 2013 at 9 a.m.
SanDisk's new Extreme MicroSD offers much faster random read/writes than the larger version, but in most cases, you should just buy the appropriately sized card for your device. Which is the more useful card: the SD, used by millions of cameras, the Nintendo 3DS, and hobbyists playing around with microcontrollers like the Arduino--or the microSD, used by millions of smartphones, some tablets, and newer video cameras like the GoPro Hero 3? Because the baby-sized microSD format uses the exact same standard as the full-size SD card, a simple adapter makes the microSD compatible with the entire range of Secure Digital devices. Doesn't that, alone, make the microSD the more versatile card? Why should we ever buy full-size SD cards when microSDs can fit in so many more devices? Two reasons: Speed and price. My go-to SD card is the SanDisk Extreme, which is a Ultra High Speed I card rated for 45 MB/s performance. 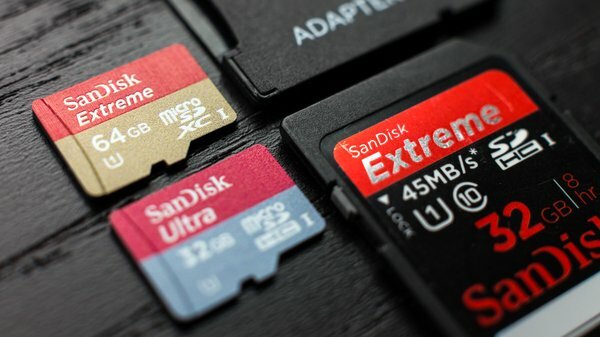 When researching SD cards for The Wirecutter, I couldn't find any competitors with the bang-for-your-buck value of SanDisks or the same reliability. Other companies like Samsung and Kingston make perfectly good cards, but they're often slower or more expensive. Last week SanDisk sent me their newest microSD card, another in the Extreme line, to test out. It seemed like this might be the card to prove that microSDs can be fast enough to replace their bigger brothers in cameras, while still being the most common expandable storage format for smartphones. Here's what I found. A bunch of speed tests later, I discovered the Extreme microSD nearly matches the full-size version I've been using for a few months, and I've found a few reasons that microSDs may be worth buying to use in full-size SD ports. Speed is no longer a limitation. But price is--unless you know you'll want to use the card in both full and microSD devices, there's not much reason to buy a microSD card. I've used both the SanDisk Extreme and an Amazon Basics Class 10 card in the Sony NEX-F3 camera. When shooting pictures or video with the NEX-F3, the Extreme dramatically cuts down on the amount of time it takes to process a video and pull up stored photos. Best of all, the card is cheap--it costs $32 for 32GB on Amazon. SanDisk makes an even faster card, the Extreme Pro, which is rated for 95 MB/s performance. But it costs twice as much ($66), and many devices unfortunately won't be able to make use of that full speed. 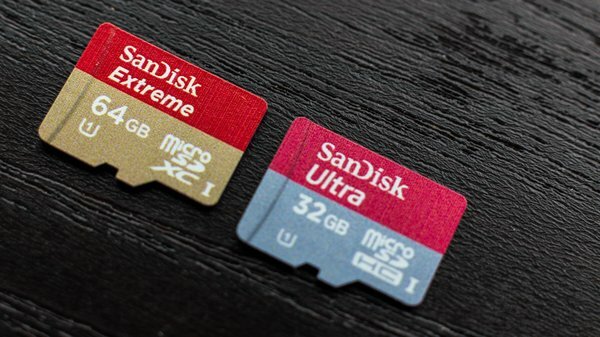 Until recently, SanDisk had two UHS-I microSD cards: the Ultra and the Extreme Pro. Like the full-size Extreme Pro, the microSD version is supposed to hit read speeds of 95 MB/s. Fast. And, likewise, it's expensive. There's no 32GB version, but the 16GB version costs $43. Almost three bucks a gigabyte. The Ultra, comparatively, is really affordable--only $25 for 32GB. That's even cheaper than the full-size Extreme I use regularly. Of course, it's slower, too--the Ultra is an older card. And then there's the new Extreme microSD, which is much faster, but costs $47 for 32GB. Here's a chart of read and write speeds in CrystalDiskMark. Just going by general price and performance, there's no reason to buy a microSD card if you know that you'll be using it for a camera with a full-size slot, or in a Nintendo 3DS, or as expandable storage in a laptop. Really, there aren't that many devices that use either form factor of the SD standard. Some Android phones and tablets support micro cards, but most have opted for onboard storage only. MicroSD is versatile enough (and tiny enough) to have a few other interesting uses, however. For example, a microSD card can fit into a MemoryStick Duo adapter to go into an older Sony camera. Until a few years ago, Sony didn't support the SD standard, but unless you're using a four year old Sony camera, this won't do much for you. Some dedicated GPS devices, like Garmins, use microSD cards. You can load them up with more map data. There's also the NiftyMiniDrive for MacBooks, which takes a microSD card and neatly slots it into the side of an Apple laptop (cards normally stick halfway out of the slot in Apple's design). It's a decent way to add more expandable storage to your laptop, although it won't be nearly as fast as the onboard SSD. Just about any microSD card you buy will come with an adapter for a regular SD port, so compatibility isn't an issue. But most of us buy memory cards for a single device--a camera, or a phone, or an Arduino project--and don't need to move it between a range of different devices. By that logic, it makes much more sense to buy the right form factor for the right device. If you don't mind paying a little more, SanDisk's Extreme microSD is, surprisingly, an even better card than the full-size alternative. The microSD SanDisk Extreme pokes one hole in that theory, however. In sequential read and write speeds, it posts extremely similar speeds to the full-size Extreme card. I was testing a 64GB micro vs. a 32GB standard SD, and larger capacities can mean slightly faster speeds. But check out the huge, huge gap in random 512K read/write speeds. The newer microSD Extreme absolutely crushes. Does that matter? Does that make it worth buying, even though the 32GB version costs $15 more? Depends on what you use the card for. In a camera, those random R/W speeds don't matter much. 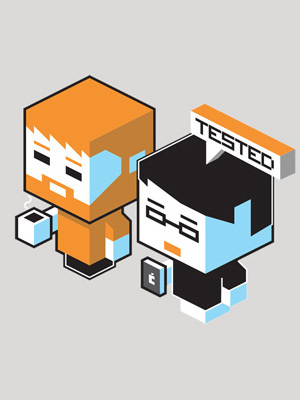 If, however, you want to run programs or an OS off the card, those random speeds are pivotal. At that point, you may just decide to step up to the full-size Extreme Pro SD. There aren't many inherent benefits to buying a microSD card for use in regular SD slots. But if you don't mind paying a little more, SanDisk's Extreme microSD is, surprisingly, an even better card than the full-size alternative.